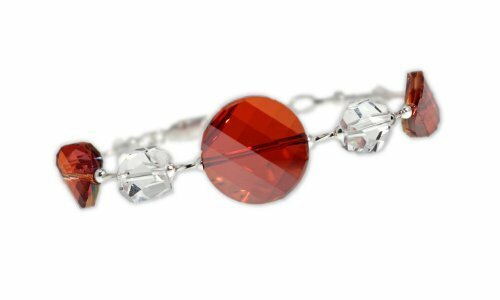 This piece gets twisty with large & small Swarovski magma red twist crystals. And if that isn’t enough, Swarovski helix and graphic cube crystals add even twists & turns! The crystals in this piece deliver colorful flashes of light. Closes with a sterling silver lobster claw clasp. This piece is about 3/4 inch at its widest point and measures approximately 7 to 8 inches in length via extender chain. Premiered in our Winter 2012 collection. Signed by Autumn’s Glory. This piece comes in a silver gift box for gift giving. Note that product images are not to scale. Please refer to description for more information.